Sound good and fair to me.Waiting for 01/04! Excellent. I was hoping to see more combo progs in the well established spirit of aitb. Good idea, a bell in (or near) 1 khz that we could drop (-4 or -6 db) would be great. It's a bit complicated to evaluate the package only hearing the mid band. These have really interesting differences in the hi-low bands too. It's a pretty big package. 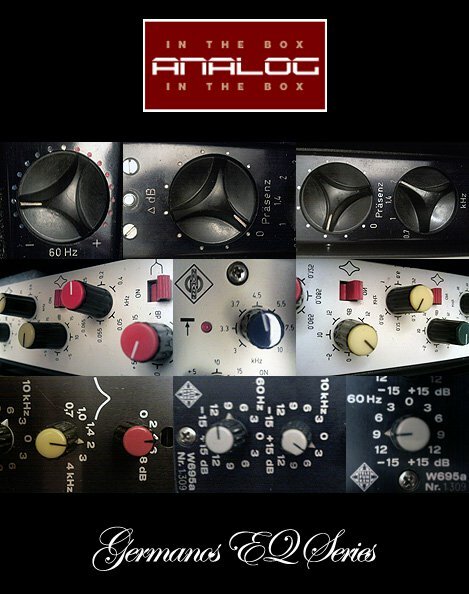 Analog in the box stuff is a no brainer - bought!!!!!!!!!!!!! tumburu wrote: It's a bit complicated to evaluate the package only hearing the mid band. These have really interesting differences in the hi-low bands too. Lol mid+high+low bands...whats left to sell? what i think would be an amazing idea, and a very helpful tool would be an analogue in the box TOTAL eq demo and evaluation EQ program. this would have 3 eq bands, maybe 80 bass 2k presence and 10k high. only a few cut/boost options like +3dB and -3dB BUT it would have another selector to choose which EQ is being used like doc fear, fate, this new one etc. Anyone compared the W295b to the one by CDSoundmaster ? david1103 wrote: what i think would be an amazing idea, and a very helpful tool would be an analogue in the box TOTAL eq demo and evaluation EQ program. Would love to try these slicers out.